Decorative Pirate Swords are 29 ½ inches in all. These very popular pirate swords have an antique brass colored metal guard that is engraved with a detailed image of a pirate ship. The black leather covered wooden scabbard features antique brass colored metal fittings that are engraved with a skull and crossbones pattern at the throat and a pair of flintlocks on the tip. The polished 22 ¼ inch steel cutlass blade features a display ready factory edge. 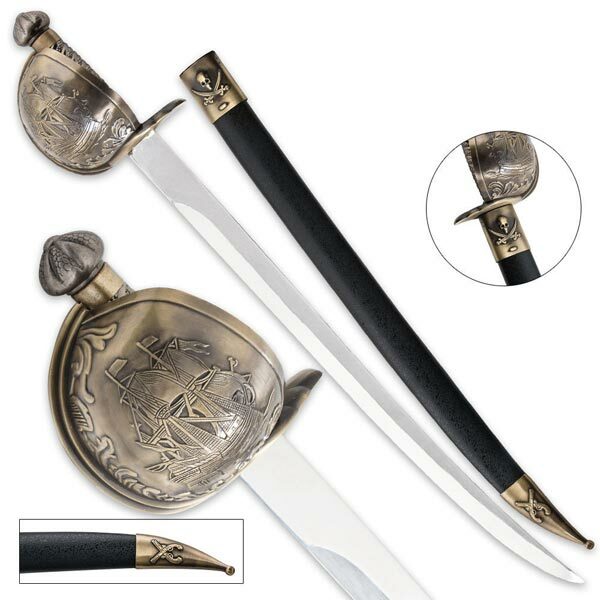 These swords are great for gifts, costumes, displays and custom engraving. Buy these popular Decorative Pirate Swords for only $59.99. Customize this piece with laser etching. Laser Etch up to 60 characters per sword. Swords can be individualized with names, phrases or credentials. This service is ideal for ceremonies, personalizing gifts and awards. The etching will be placed above the guard on the right side of the sword and will read from left to right or from the hand guard to the blade point of the sword. Add the laser etching text service for only $25.00 per sword. Logo services are also available. After purchased, just fill out the form here.